I don’t know how to date my Loco X-frame. But from information reproduced below, at least I know this model was manufactured between 1936 and 1955. The model name is visible, above. It did not need to much to put it back on the road, essentially only a brake overhaul and new front tyre and tube. It now rides well. Locomotief merged with Simplex in 1952. This was a successful merger and, by 1960, the company were manufacturing about 10% of the Dutch total production. 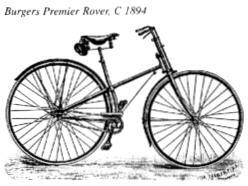 In the UK, however, homeland to the bicycle industry, cross frames were manufactured up to the thirties. 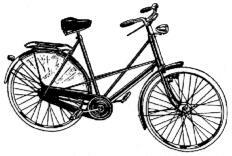 Raleigh, had them in their collection as early as 1897, kept on advertising them ‘at home’ up to 1935, and in the Netherlands even until 1936. One of the first, if not the first, was Gazelle in 1930. Other well-known brands like Simplex, Juncker, Locomotief and Germaan followed suit in the late thirties. In the early fifties, every major brand had one or more models in its collection, with the striking exception of Fongers. The probably most popular model was the Locomotief “Super de Luxe”, which was promoted as a unisex cross frame. What you see below, under the rear rack, is a bike lock mechanism. The Sturmey-Archer 3-speed hub does not have markings that co-relate to the S-A dating charts, as where 2 digits are generally stamped in to show the last two numbers of the relevant year, mine only has the number 4.
it. On the rear hub you found “4 … 12” and I’m quite sure that this must be “54 … 12”. “shade” of a 5 left to the 4. Maybe I’m dreaming. So Locomotief used the same numbers every five years. Thanks Herbert. I’ll have to climb over quite a few bikes now to get to the Loco in my storage place. But next time I’m feeling athletic I’ll check the frame number from the information you’ve provided.